I keep reading and listening to people say lowsec is dying. Apparently, if big groups with shiny and expensive toys can't live in the security band, then the area will soon become a desolate, barren area populated by tech 1 cruisers, the Frigate Menace™, and scavengers picking through the scraps CCP leaves as the developers cater to the null sec cartels. Did someone say scavengers? I spent most of the last 6-8 months mostly in high security space, with a little time spent mining in low and null, acquiring a Nestor. I thought about making ISK grinding out and selling a Nestor a month, but that idea died with the crashing market for pirate battleships. So since the next item on my list of things to do is learn how to fly recons in totally ridiculous ways (i.e. doing PvE), I think a return to low sec is warranted. If I return to lowsec, I'll have more on my mind than using recons to run the combat sites. I will, of course, mine. I have a crazy, impractical, long-range idea of getting excellent standings with all of the NPC corps that send out mining fleets. I already have the standings with the Minmatar Mining Corporation and Thukker Mix, but the Vherokior Tribe doesn't have mining agents. That's where the recons come into the picture, if I don't decide to just run distribution missions for a couple of days. I think the new shiny CCP is dangling in front of players to entice them into mining in low sec is moon mining. Good! Hopefully that idea will distract the elite PvPers of low sec into concentrating on moons and leave the belts alone as not worth the effort. What's a sexier kill mail, a Procurer or a Rorqual? Oh, who am I kidding? I don't foresee a lot of moon mining occurring in lowsec. If I am going to carebear it up in low sec, I'll need to do two other things. The first is run mining missions. I did a little research last night and lowsec has some nice level 4 mining agent hubs. The biggest one I found so far has 9 agents in one system. I could make some serious ISK long term in that system. The second is set up planetary interaction colonies again. I don't think I've done PI in over two years, maybe even three. But I think I'll need the extra money living in low. I'll firm up my plans once I get back home from Fanfest. I might even learn some things that could help while in Reykjavik. But since Lowsec is Dying™, I probably picked the right time to return. Next Monday I arrive in Iceland for eight days and seven nights of fun in the middle of the North Atlantic. Well, for what I hope is fun, anyway. I also intend on doing a little bit of blogging, even if I only post photos. I am going through all the steps I normally go through when preparing for a trip overseas. This weekend marks my 11th trip since 2017. I have most of the required actions memorized by now, but sometimes making a list helps prevent forgetting the little things that turn into headaches if forgotten. First, inform all the institutions you interact with that you are leaving the country. In my case, those are the post office, my bank, and my phone service. The U.S. Post Office has a nice form one can fill out in less than a minute. Banks have a tendency to not allow foreign transactions unless notified in advance, and my bank is no exception. Fortunately, I got my credit cards approved for use in Iceland at the same time I paid some of the bills that come due while I'm away. As for my phone service, that's not really a factor if one buys a SIM card from the local wireless provider in Iceland, which I believe is available in the airport. However, my phone provider allows me to use my current data package abroad, although I have to pay a $10 fee each day I use it. Still, having 24 GB available is more than I'll use and means I won't have to worry about the data cap. Next, print out all paperwork needed to travel from home to the hotel in Reykjavik. Icelandair requires a printed version of the e-Ticket passengers receive via email. If one purchases Flybus tickets for the ride between Keflavik and Reykjavik in advance, Flybus requires printed proof of purchase as well. I also normally print out the hotel reservations, just in case. The next subject is a big one: electronics. I normally bring a laptop, smartphone, Kindle Fire, and camera to Fanfest. Based on my experience from last year, I am also bringing an external battery to recharge my smartphone. If I did not plan to blog and do some RMT research-related tasks, I would leave the laptop at home. The most important fact for those coming from the U.S. and U.K. is that Iceland uses the Type F socket, which is also is usable with Type C and E plugs as well. For everything except my laptop, I use a Yubi Power 4-port power station to keep everything charged. Normally in hotel rooms spare outlets are at a premium so I like the option of charging four devices with only one charger. For my laptop, I actually own a cord that plugs into the laptop's power converter instead of just using an plug adapter. I prefer the tighter connection into the wall socket, plus the price was low enough I didn't mind. For those lugging around a laptop, I highly recommend making sure your laptop has all OS updates installed before heading to Iceland. Getting hit with an update in an airport is not my idea of fun. In addition, make sure all programs like TeamSpeak, Mumble, and Discord are up-to-date as well. For the first time traveller, I have one tip that doesn't seem important, but is. Clean up your home before leaving for the airport. Make sure to take out the garbage. Check the refrigerator for food that may spoil while you're away. Do the dishes. Make your bed. Not just throw the covers over the bed, actually make the bed, hospital corners and all. I didn't think making the bed was really that important until the one trip where I had to leave at o'dark thirty. I just hurriedly threw the covers over the bed because I was in a rush. After a few days of maid service, coming back to an unmade bed was a bit of a downer. One final tip. I didn't mention anything about exchanging money to the local currency, the Icelandic Krona (ISK). Iceland pretty much runs on plastic except for the city buses, and even then some of the outlying hotels hand out passes to their guests. I have a credit card that doesn't charge foreign exchange fees, so last year I just used that and had no issues. I'm sure I forgot some things, but I have enough practice packing for these trips that I just do some things automatically. Hopefully those travelling to Fanfest for the first time will find something useful. Who knows, some of the information concerning products may actually come not too late. EDIT 1 April 2017: Here's what I forgot. Make sure you can still close and lock your luggage. Good thing I only needed one suitcase. The voting for the 12th Council of Stellar Management ends on Monday at 0000 UTC. While historically most players vote in the first 2-3 days, voting sees a spike on the final day. So for those who want to vote but don't want to scroll through 64 candidates, I'll go through the candidates I voted for on my three accounts. 1. Roedyn - Roedyn tops my list for two reasons. The first is that I like the idea of the 3 candidate "High Sec Bloc". If one of the members of the High Sec Bloc, Roedyn, commander aze, or Toxic Yaken, win a seat, then we may see more teamwork from people outside of null sec in the future. The second reason is that Roedyn knows a lot about markets and trading. He used to write a market column for Eve-NT and also did quite well for those who gave him ISK to invest. Roedyn is also involved in attacking citadels in high sec, which gives him a unique perspective compared to those used to dealing with the huge structures in more dangerous areas of space. From everything I can see, structure development will still matter greatly on the roadmap over the next year. 2. commander aze - I like candidates who grow, and over the past few years commander aze really grew in terms of EVE. His campaign this year reminds me of Mike Azariah's run in 2013 when he finally won a seat for CSM 8. Successful CSM members need to have a varied background, and commander aze qualifies on that score. Currently he runs an alliance out of a C2 wormhole with a large high sec presence due to the new players he recruits. Introducing new and Alpha players who cannot use cloaking devices to wormhole life is thinking way outside the box. Commander aze also is involved in NPSI fleets as a Spectre Fleet FC and the captain of last year's Spectre Fleet alliance tournament team. 3. Toxic Yaken - Toxic Yaken is the third member of the High Sec Bloc who recently joined a smaller null sec alliance. While he has not displayed the variety of a Roedyn or commander aze, his work on the Wardec Project shows his ability to reach out to players with different play styles than his. He may lose votes as his background is as a high sec wardeccer and a ganker. 4. Scylus Black - Scylus is a player involved in the Caldari militia since 2012. He served as the former CEO of CCDM and was the former alliance Executor of Templis CALSF. When I look at low sec candidates, I want to see ones who actually live in the security band and don't just cruise though looking to PvP. Scylus Black fits the bill and probably has a good chance of winning a seat on the CSM. 5. Erika Mizune - Erika is someone who is a null sec candidate who is more involved in industry and jump freighter logistics rather than PvP. She would have won a seat on CSM 11 except that when the election was rerun after Apothne dropped out for health reasons, she dropped from 13th to 15th. Once again, I figure that industry will matter in the next year and that Erika will have the opportunity to regularly contribute. 6. Djavin Novienta - Djavin is a self-described high sec carebear in EVE University. He won me over with his interview with Matterall on Talking in Stations. Djavin fulfills support roles within EVE University including recruiting and as a wiki curator. Sometime soon the corp and alliance tools will finally see upgrades and I think Djavin will provide valuable feedback in that area. I also like the perspective that a high sec carebear will bring to the council. 7. White 0rchid - White 0rchid is a low sec candidate in WAFFLES. who also has experience in EVE University. The quality that led me to put White 0rchid on the list was his developer skills, which could come in handy. On Thursday, CCP announced changes to the 30 Day Pilot's License Extension (PLEX), EVE Online's signature item for converting real world currency into Interstellar Kredits (ISK), the in-game currency. PLEX will convert 1 PLEX into 500 PLEX. A new account-wide storage container, the PLEX Vault, will hold PLEX. The New Eden Store will use PLEX for transactions instead of Aurum. Aurum will no longer exist. The conversion rate for Aurum to the new PLEX is 7 AUR to 1 PLEX. CCP will not convert amounts of Aurum 1000 and under into PLEX. Following the announcement, a lot of misinformation and conspiracy theories started flooding the usual places like Reddit and various fansites. Since I have a little knowledge about the subject, I thought I would address some of the issues and questions emerging from the EVE community. What is the real world value of 1 Aurum? $0.005 USD, or one-half of one U.S. cent. One of the problems that I see with the valuation of Aurum against a real world currency like the U.S. dollar is that people take the most expensive cost to purchase an item like PLEX or Aurum and use that as the conversion rate. In the case of PLEX, people will use the $19.99 price for a single PLEX instead of using the price CCP charges for purchasing 2 or more PLEX, which is $17.495 per PLEX. The $19.99 price is a premium price for purchasing an odd amount, not the regular price. When using the regular price, the USD to Aurum conversion rate is $0.004998 per Aurum, ($17.495 / 3500 AUR) which rounds up to $0.005/AUR, or one-half of one U.S. cent. The same figure is obtained when using the prices listed when purchasing Aurum with U.S. dollars directly. Using the $9.99 for 2000 Aurum option, the USD to Aurum conversion rate is $0.004995 per Aurum, which rounds up to $0.005/AUR. When performing the same calculation using the $24.99 and $49.99 packages, the conversion still rounds up to $0.005/AUR. How much ISK is 1 Aurum worth? 288,444.44 ISK, based on Jita market prices on 18 March 2017. One major logical problem I see is that people attempt to convert Aurum into ISK using PLEX. The problem is that while players can convert PLEX into 3500 Aurum, the reverse is not true. The New Eden Store contains 3 items one can describe as RMT tokens: skill extractors, Multiple Pilot Training Certificates, and Pilot's Body Resculpt Certificates. While skill extractors are the least costly item of the three on the market, the fact that skill extractors trade in the thousands each day while the others trade from 20-40 per day make the skill extractor the item I would use to perform the calculation. Skill extractors come in three packages: 1 for 1000 AUR, 5 for 4500 AUR, and 10 for 8000 AUR. I used the 5 for 4500 package when making the conversion. Why split PLEX into 500? Why value 1 PLEX = 7 Aurum? A lot of people consider 500 and 7 very odd numbers that don't make sense. But if one takes into account CCP's historical preference to buy game time in blocks of 60 days, the numbers make more sense. Players can currently convert 2 PLEX into 7000 Aurum. What's a nice round number? 1000. To get to the round number of 1000, CCP has to make each new-style PLEX worth 7 Aurum. After that, each old-style PLEX converts into 500 new-style PLEX. "A large portion of the total Aurum stockpile is in small balances left over from past giveaways and by not converting those small balances we mitigate risk of oversupply in the PLEX market." But why only convert Aurum balances of 1001 and up? Why not convert balances of 1000? The answer apparently is that 1001 is divisible by 7 (143.0) while 1000 is not (142.857). The figure 1001 appears strange for two reasons. First, one can purchase RMT tokens such as skill extractors and Pilot's Body Resculpt Certificates using 1000 AUR. If a player had the ability to purchase RMT tokens before the changes, one would think the player should receive RMT tokens (PLEX) after the change. The other reason is that CCP offers a package of 900 AUR for $4.99. If the concern is unused Aurum from previous givaways, what about untouched Aurum from a purchase from the Aurum store? If CCP asked me for advice, I would recommend a cutoff of 700 AUR to reimburse. A figure of 700 addresses the previous promotional givaway concerns, especially with the recent givaway of 300 AUR in December. In addition, 700 AUR would convert to 100 new-style PLEX, which is a nice round number. If 700 AUR is too low, then a cut-off of 900 AUR is more reasonable than 1001. Will we see prices go up? Yes, but not across the board. CCP has stated that anything that costs 1 PLEX now will still cost 1 PLEX after the conversion. So that means no price increase for things like the Multi-Pilot Training Certificate and 30 days of game time. A question exists about character transfers, as CCP offers the service for $20 or 2 PLEX. Hopefully the charge will remain at $20 or 1000 PLEX. Some items will undoubtedly increase in price. Good candidates include skill extractors and Pilot's Body Resculpt Certificates increasing from $5.00 (1000 AUR) to $5.25 (150 PLEX) in price. Also, the prices of some SKINs in the cash shop may slightly increase in price. On the other hand, some of the older SKINs may decrease in price. Many of those SKINs currently list for 250 AUR. Listing those SKINs at 35 PLEX after the change would represent a small decrease. Why did CCP create the PLEX Vault? On Saturday, CCP Rise appeared on Talking in Stations to discuss the upcoming changes in PLEX and Aurum. While safe movement of PLEX will occur, the major reason appears technical in nature. CCP needs to convert an object in the game client into a currency in the New Eden Store. The item changes state in the PLEX Vault. The Aurum listed in the New Eden Store is account wide, so the PLEX Vault is account wide. The year 2017 is a very bad year so far in the courtroom for Bossland GmbH, maker of the Honorbuddy bot for World of Warcraft and many other bots. Blizzard's legal team had suffered setbacks in the past in German courts, but the tide has turned recently. On this side of the Atlantic, Blizzard is about to win a virtually uncontested case against the German bot maker in California. At the same time, the concept of End User License Agreements and Terms of Service may gain more legal weight. In the judgment at first instance on this dispute, the Landgericht Hamburg distinguished between general conditions of business in the actual case and mere "rules of play", which the provider of a game could unilaterally establish and modify without having to be contractually agreed with the players. There are quite a number of arguments for such an approach . In the second instance, the Court of Appeals had left open the question as to whether there was a real difference between the GTC and the "rules of play". However, the BGH now finds clear words. In any event, if the "rules of the game" - as in the present case - are designed as restrictions on the granted license for the use of the software and the provider has a right of termination in the case of infringement, they should also be in the GTC and should be effective in accordance with the General rules are included in the contract and must be subject to a content check at the standards of the GTC law. According to this decision of the Federal Court of Justice (BGH) "game rules" must be regarded as a GTC in any case if they restrict the actual possible use of the game legally and give the provider binding sanctions. Such rules must therefore also be accepted by the players as other GTCs. However, this is sufficient if this is done within the scope of account registration. If the use of bots is prohibited in the game rules, this is effective and also leads to injunctions against third parties, which offer such bots for the on-line game. The case is now heading for the Federal Constitutional Court (BVerfG), where the bot maker's lawyers will argue that the rulings infringe upon both Bossland and its managing director's fundamental rights under the Grundgesetz, or German constitution, specifically Articles 3 and 12. (g) Defendants distribute the Bossland Hacks via content delivery networks and servers located in the United States and the State of California. That is tactically excellent, if it just where true, to make the "Long-arm Statutes" to work. But none of that is true and all of that is very vague, perfectly made for the court to believe. Neither we have employees in the US or in California, nor do we host our websites and download portals in the US. And we never used CDN, our french servers can handle it very well. But nice try. Then there is the „Tag Jurisdiction“ based on U.S. Supreme Court im Fall Pennoyer v. Neff (1878). As you can see, this one is pretty old, for it to work, the person in interest must be in the state or country where he is to be sued. Best known case here is Burnham v. Superior Court of California from 1990. And of course, if the company has its residence in the US. But we for sure have no residence there yet. Anyhow, lets assume such a lawsuit passes the court and a company gets sued in the US, that would lead to payments of Punitive Damages. Everyone knows the MDY case and the Ceiling Fan cases, one for $6M, the other one for $7M in Punitive Damages. However, according to EU law, such an judgement would be not acccredited in the EU. The Ordre public clause is written in n § 328 Abs. 1 Nr. 4 ZPO, Art. 27 Nr. 1 EuGVÜ and Art. 34 Nr. 1 EuGVVO. The presiding judge on the case, Judge David O. Carter, disagreed and denied Bossland's motion to dismiss due to lack of jurisdiction on 25 January. After some additional legal moves, Bossland defaulted the case on 16 February. On Monday (13 March), Blizzard submitted an entry of default judgement against the German bot maker. Bossland distributed and actively encouraged the use of software which, when used by the end user, creates a derivative work of one or more of the Blizzard Games. Bossland also encouraged and facilitated acts of copyright infringement by its freelance contractors and software developers. This conduct constitutes secondary copyright infringement. Bossland created and distributed computer files designed to circumvent and bypass access controls put into place by Blizzard. This conduct violates Section 1201 of the DMCA. Judging by the description above, any effort to sell products in contravention of a game's EULA probably violates California state law. The next confirmed date on the legal calendar is 10 April, when Judge Carter will hold a hearing on the default judgement against Bossland. Blizzard's years-long legal effort against Bossland is reaching the end game, both in the U.S. and in Germany. Given the pace of the legal system in both countries, the cases could go another year, depending on appeals. However, Blizzard once again looks to have the upper hand over a bot maker. Ever wonder why Asian games rely so heavily on point-and-click movement systems? Smoking. Asian gamers will spend a lot of time in internet cafes, using the mouse to grind out mobs with one hand while smoking with the other. I stopped smoking 15 years ago, but I've always preferred using the mouse exclusively when given the chance. Between the use of the WASD keys for movement and years of crafting in Everquest 2, my left hand tends to get tired and sore after a few hours of playing a normal game. One of the benefits for me of playing EVE is the ability to just use the mouse and peck the function keys every so often. I guess that makes me an honorary smoker. One of my favorite features in EVE is exploration and the probing mini-game. 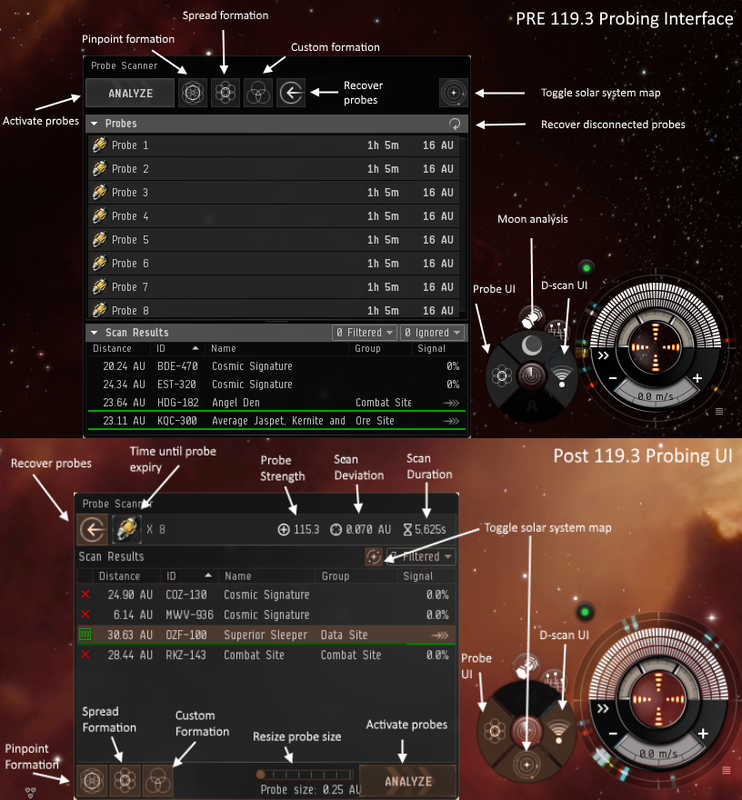 Before heading off to the Singularity test server Sunday to look at the feature myself, I had heard everyone gush at all the shortcuts CCP had added. "Great," I thought to myself. "Will I need to start using the keyboard in order to probe down sites?" On Sunday, I scanned down a few signatures and didn't like the experience. In fact, I was so disgusted I didn't write a post for Monday. But last night, in preparation for writing this post, I discovered that some of the things I found so irritating during Sunday's play session were either awkward mechanics or outright bugs. The first bit of trouble I had with the new probing user interface was that the map toggle button does not show up automatically. On Sunday, I thought I would have to use the F9 key to toggle between the map and regular space. But last night, I discovered how to make the toggle button appear. Initially, the probe scanner window is docked in the map. While the window is docked in the map, the map toggle button will not appear. The solution is to display the system map in any mode except fullscreen. Then, click on the square in the upper right-hand corner of the probe scanner window to undock the window. Place the window in the desired location, then make the map fullscreen. Presto, the map functions similarly to the old map and you can toggle the map on and off using one click of the mouse. For years I always had the probe scanner window sitting in the lower right hand corner of the screen, with the ship information wheel in the middle bottom. I have the feeling whoever designed the changes plays with these two pieces of the UI at the top of the screen. 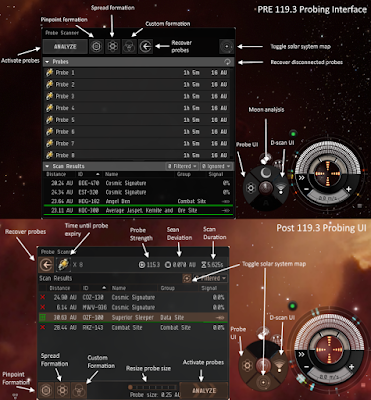 The buttons to launch probes, resize the probes' search areas, and the Analyze button are all at the bottom of the probe scanner window. In a move that may have some players swearing, the recall active probes button is now where the Analyze button formerly resided. I can see some players' muscle memory recalling probes right as they were about to resolve the signature. Instead of buttons across the top of the window, the new UI contains information about the probes. In addition to the probes' status, players can now see their probe strength, scan deviation, and scan duration. One new feature not shown in the graphic is the ability to shift the point of view from the system plane to directly over the system plane by double-clicking the mouse. I think the feature will alleviate an issue I had with rotating the view in very large systems with probe size diameters under 1 AU. In those cases, rotating the view more than 90 degrees was awkward. I'll need a lot more experience once the feature is deployed on Tranquility to see if the situation improves. Having spent a couple of hours playing with the system, I think I have a good handle on how to probe without using the keyboard. The graphic for the new UI shows my results of probing down a Superior Sleeper Cache. First, I positioned the probes around the signature and pressed the Analyze button. I then positioned the probes around the resulting point and clicked on the Probe Size slider. The search radius can be adjusted by either clicking to the right or left of the current size, dragging the slider to the desired size, or, if the slider is clicked on and is the active window element, using the mouse wheel. Once the desired size is reached, click on the Analyze button. Rinse and repeat until the signature reaches 100%. I did have to use the button to reposition the individual probes closer together, but that was also necessary with the old system. And honestly, if I had used Sisters gear instead of regular gear, I wouldn't have had to do that. Once I discovered how to only use the mouse to probe down anomalies, I fell in love with exploration. Despite what I had heard coming out of the CSM summit, I don't feel the new UI puts button smashers like me at a disadvantage. I'll just need to develop new muscle memory and perhaps play with my window layout. And hopefully when the changes hit Serenity, all the smokers will feel the same way. Yesterday, I compared EVE Online's Council of Stellar Management election to an online survey. If the CSM is a focus group that has signed non-disclosure agreements, then why not extend the market research theme to include the methodology used to select the body's members? In my previous post on the subject, I stated that the election was basically a one question online survey. What I didn't discuss was the complexity of the question. Unfortunately, the question isn't, "What is your favorite flavor of ice cream?" Instead, CCP asks players to choose up to 10 candidates out of a list of 64 and then rank them in order of preference. Looked at another way, voters are asked 65 questions. The first 64 questions are yes/no questions, asking if a candidate should sit on the CSM. The 65th question is, "Please rank your choices in order of preference". "Can we always assume that longer surveys contain less thorough answers? Not always, since it depends on the type of survey, the audience, and the relationship of respondents to surveyor, among other factors. However, data shows that the longer a survey is, the less time respondents spend answering each question. For surveys longer than 30 questions, the average amount of time respondents spend on each question is nearly half of that compared to on surveys with less than 30 questions." So how do these two facts apply to the CSM elections. First, the sheer number of candidates guarantees a lower participation rate. Even if a voter only takes 60 seconds to consider each candidate, that still means that the voting process will take over an hour. People looking at the list of candidates may just throw their hands up in the air and say that voting is just too time consuming. The second is that a large percentage of those who do read about all the candidates will likely race through the list in order to get back to playing the game. A perfectly understandable reaction. The amount of time one would need to research all the candidates leaves players willing to take suggestions from others that a player trusts. In terms of time management, voting with a pre-made link makes a whole lot of sense. Of course, that's how bloc voting is sustained. Did I mention that due to the voting blocs, many players believe their vote will have no impact, thus driving down turnout? I am sure I missed a few other drawbacks of the number of candidates on the ballot. But in market research terms, a successful survey is usually both short and simple, two things we cannot say about the ballot in the current election. "A focus group is a small, but demographically diverse group of people whose reactions are studied especially in market research or political analysis in guided or open discussions about a new product or something else to determine the reactions that can be expected from a larger population. It is a form of qualitative research consisting of interviews in which a group of people are asked about their perceptions, opinions, beliefs, and attitudes towards a product, service, concept, advertisement, idea, or packaging. Questions are asked in an interactive group setting where participants are free to talk with other group members. During this process, the researcher either takes notes or records the vital points he or she is getting from the group. Researchers should select members of the focus group carefully for effective and authoritative responses." Kind of sounds like the two yearly CSM summits, doesn't it? For the current topic, I want to concentrate on the last sentence in the passage from Wikipedia. How does CCP select their focus group? In a typical, EVE Online game design move, CCP throws caution to the wind and lets the players decide and sees what happens. The result is the annual CSM election. In effect, CCP conducts a one question online survey asking its customers who should participate in the focus group. By allowing the players to choose the members themselves, the developers can avoid charges of favoritism. Well, perhaps minimize the charges. The composition of the group itself could lead CCP to modify its development plans. What happens if two wormhole candidates or two lowsec candidates win? Is that a sign that the players in those areas of the game are disenchanted and may need some attention to avoid subscription losses? If we look at the CSM election as a market research exercise instead of a political election, some of the numbers look quite different. In the real world, a turnout of 12.5% for an election is horrible. But according to SurveyGizmo, a company that makes market research software, the average response rate for surveys distributed to external audiences such as customers is 10-15%. For the years in which we have data, the participation rate in CSM elections falls within that range. Survey Distribution: If your audience consists mostly of digital natives, sending out links via social media will net you some good response rates. If you’re surveying retirees, you may want to choose an alternative distribution method. Customer loyalty is a pretty basic concept. If someone only plays EVE for a couple of hours on the weekend, getting caught up in small changes in the game probably doesn't seem worth the effort. For those who play 3-4 hours a day, sending people to Reykjavik to make sure CCP doesn't mess up the game probably comes pretty high on the list of things to do. The perceived benefit directly references how a player looks at the CSM. With 64 candidates on the ballot this year, one could spend 3-4 hours just trying to figure out who to vote for. If a player thinks the CSM is just a bunch of self-important nerds who are only running to win a trip to Iceland, the player probably won't take the time to vote. Of course, if the same player is handed a pre-made voting link and told that if he votes that way, he gets credit for participating in a PvP fleet, then the chances of voting go way up. Also, if CCP offers incentives for voting, as occurred in the CSM 10 election, that also raises participation. Demographics is the major subject every year. Players in null sec vote, players in high sec don't. Players in wormholes and low sec vote when they get pissed off. Survey distribution in my mind is just the ease with which one can vote. The voting through the launcher is kind of awkward, although better than in the past. Some people don't even look at the launcher when logging in, which depresses the participation rate. If CCP made voting easier, like putting the system inside the client, rates might improve. "An important participation incentive to survey respondents is that their opinions will be heard and that action will be taken based on their feedback. If respondents believe that participating in a survey will result in real improvements response rates may increase, as will the quality of the feedback." The same holds true for the CSM. If players believe that picking quality candidates will result in improvements in the game, or at least prevent CCP from doing dumb things, then the participation rate in CSM elections will increase. I know this post took an off-beat point-of-view of the CSM election process. I thought that perhaps looking at the process from a more business perspective in the form of market research might breathe some fresh life into an old, worn-out topic. The election for EVE Online's 12th Council of Stellar Management begins today and runs through the 26th. The single transferrable vote process used in the election is complicated, so CCP produced a video on how to vote. The podcasters, streamers, and bloggers have worked hard to get as much information ready by today because most people vote in the first three days. However, the work does take a toll, at least for me. I've spent so much time trying to put everything together that I don't have a list of endorsements. I read every campaign post, every ballot statement, watched all of the Talking in Stations CSM conversations, and a lot of the content put out by the other podcasts. But systematically comparing the candidates to each other? Nope. This year, I am only convinced of one thing: Aryth from Goonswarm Federation will win a seat. Everything else is up in the air. The more votes that are cast, the greater the chaos that will ensue. Or perhaps turnout will once again only reach 22,000 and everything will come out as expected. I'll probably vote sometime next week after I get a chance to think about things a little more. If anyone is looking for more information on the candidates, I'll suggest visiting my CSM Wire site. Until I figure out who I will vote for, the site has most of the information I've gathered on all 64 candidates. Monday begins the three week voting period for the 12th Council of Stellar Management. The CSM is a group of players elected by the player-base that gets access to sensitive development material and offers feedback that hopefully leads to good decisions. According to the rules of the election, people can vote for up to 10 candidates to fill the 10 seats up for grabs. If a voter doesn't have 10 candidates in mind, voting for one is perfectly acceptable. Some will claim that not filling all slots is a waste. Don't listen to them. But how does one choose a candidate? I created a Google site, CSM Wire, that lists a lot of information about the 64 candidates running this year. The site contains the candidates' ballot statements, EVE Online forum posts announcing their candidacies, and links to media events like podcast appearances and text interviews. For those that don't want to go to the website, below are all of the podcasts and interviews I've found with content as of about midnight. I know that EVE_NT will release more of their written interviews today and over the weekend. Also, the second set of Statecraft CSM Debates moderated by JEFFRAIDER will be broadcast on Sunday. The following articles concerning individual candidates have been published.